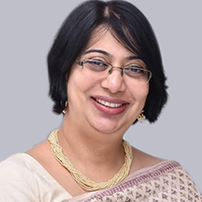 Ms. Kanika Hasrat is the General Manager of Vivanta by Taj Dwarka, New Delhi. In her current role she is responsible for the hotels performance, business growth while driving overall guest satisfaction. Kanika is committed in working closely with the team and drives performance across verticals in the hotel. Kanika has worked in diverse areas of operation within the industry including Housekeeping, Front Office and Rooms. Her expertise includes in improving standards, bringing innovation in day to day tasks and driving overall performance of the hotel. With a keen eye for detail, Kanika is very particular about her hotel rounds, looking for scopes for improvement and interacting with her guests and associates. Kanika has always been a strong believer of harnessing ones strengths and loves to work in a planned and organized manner. She believes that it is vital to work strategically and be number driven. With over 23 years of experience, Kanika has held different positions and worked with top brands like Courtyard by Marriott Gurugram, JW Marriott Mumbai, Marriott Amsterdam, Trident Jaipur and Oberoi Mumbai. Having worked across verticals within the industry, Kanika has deep understanding and vast knowledge of industry trends and happenings. In her leisure time, Kanika enjoys gardening and spending time with her family.